Eric Gjerde demonstrates 25 of his favorite tessellations and turns them into projects for newcomers as well as experienced origamists. With step-by-step instructions, illustrated crease patterns, and how-to photos, you'll learn to create these wonderful designs yourself. 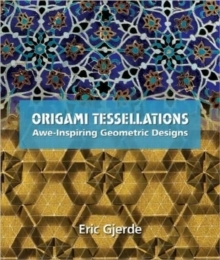 Eric's first book covers the fundamentals of origami tessellations, provides history, and describes simple beginning techniques with detailed illustrations and photographs. An extensive gallery showcases tessellations folded by the world's leading origami fine artists---inspiring you to experiment, innovate, and eventually create your own unique designs.